A 91,000 sf workplace environment for big idea people. Ellsworth is a 91,000 sf adaptive loft office reuse project available for lease at 1510 Ellsworth Industrial Boulevard in West Midtown. It is located two doors down from TopGolf's newest Atlanta location and in walking distance to the planned Westside BeltLine trail. Coming in 2017, it will be next door neighbor to the recently announced Star Provisions / Bacchanalia move. Wait, Star Provisions moved?! Click here. The project benefits from an above-market parking ratio, build-ready interiors, unbeatable natural light, and an extremely accessible West Midtown location. 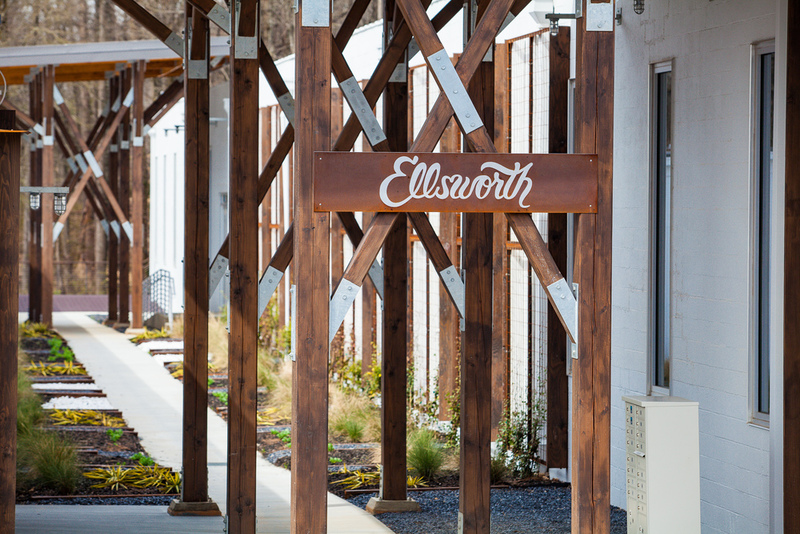 It's within short biking distance to almost a dozen dining options, and offers tenants complimentary bike access, #AroundEllsworth. Come join the diverse mix of tenants who've made Ellsworth their workplace home. CURRENT SPACE AVAILABILITIES RANGE FROM 3,000 - 50,000 SQUARE FEET. 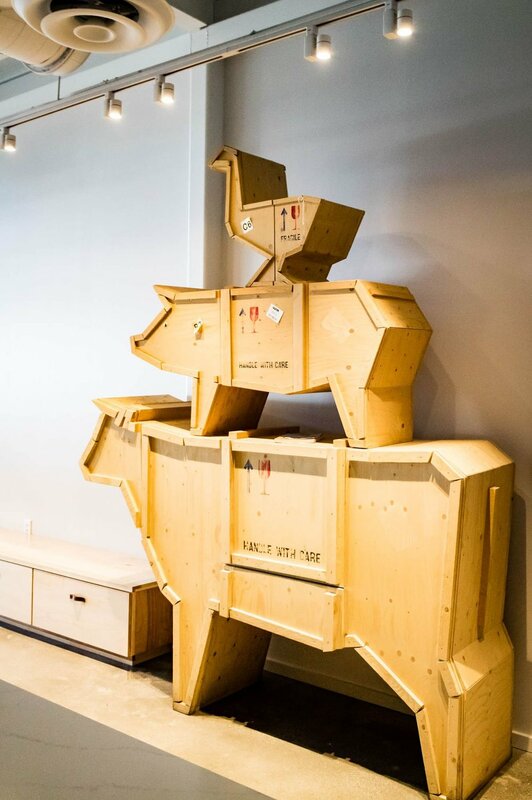 (April 5, 2017) ATLANTA – After operating out of Westside Provisions District for nearly two decades, Bacchanalia and Star Provisions have a new home in the neighborhood. 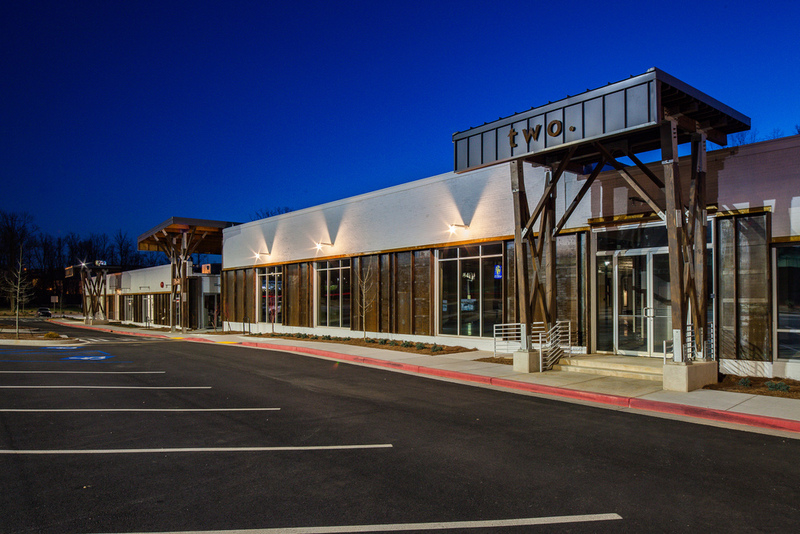 The custom-built facility for James Beard award winner Anne Quatrano’s lauded restaurant and market is officially open to the public at 1460 Ellsworth Industrial Boulevard. The building, covering 8,717 square feet, was designed by Quatrano, her husband and business partner Clifford Harrison, and architecture firm Perkins+Will. 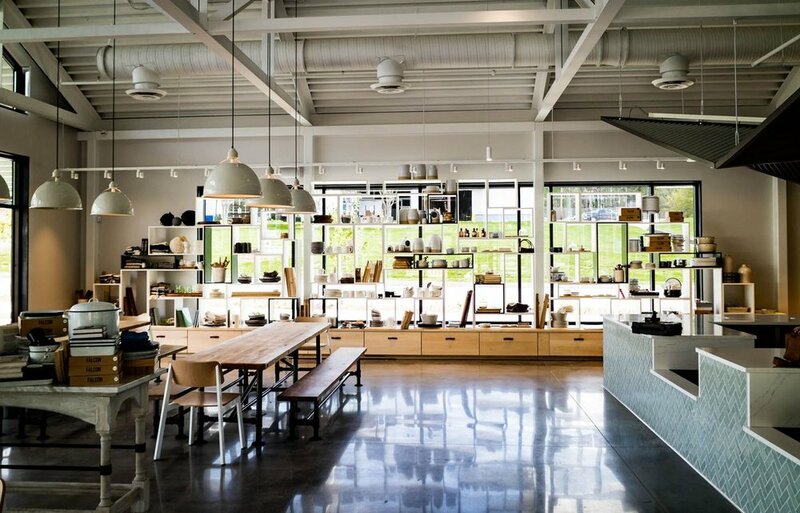 The space is inspired by the wife-and-husband team’s Summerland Farm, and it’s wide open with plenty of large windows to let in natural light. The building is split in half for the businesses, which are separated by a central kitchen and a hallway that allows patrons to walk between the two. 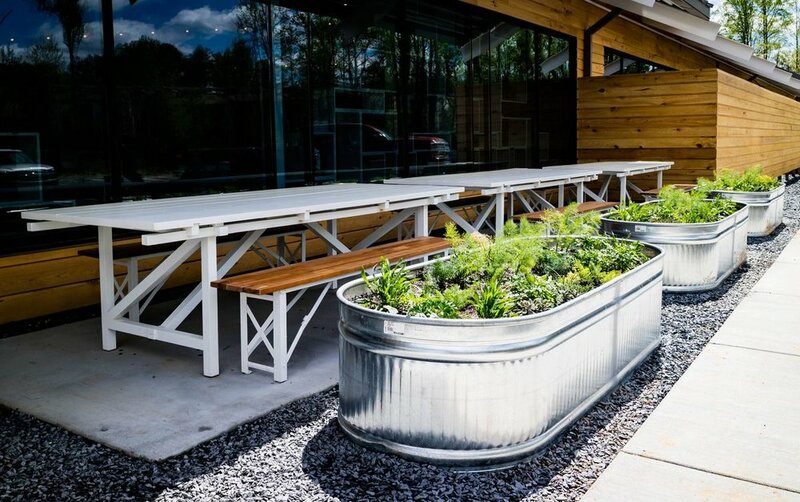 Star Provisions is open Monday through Saturday from 8 a.m. to 6 p.m., and Bacchanalia offers dinner Monday through Saturday beginning at 5:30 p.m., with no set time for end of service. Get a first look inside the new space via the photos below. We respect your privacy. Your email address will only be used for Ellsworth related news. Treanor Architects at Building One. Detail view of the central breezeway, leading to walk-out decks. Designed by Perkins + Will. Endless potential for suite innovation. A look at the interior corridor of Building One. Over a dozen bikeable amenities #AroundEllsworth. TopGolf neighbor. Directly off the Westside BeltLine Trail*. 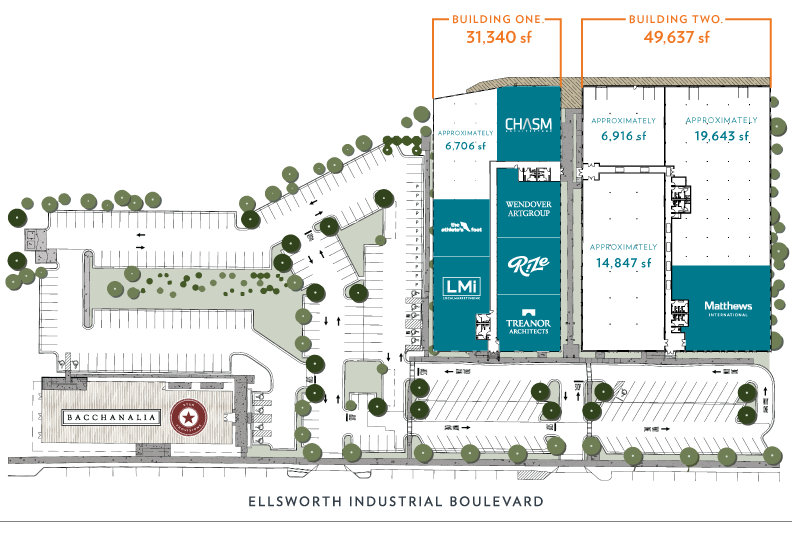 Ellsworth offers ideal proximity to the amenity-rich West Midtown design district and direct access to public transportation. *For construction updates, refer to www.beltline.org/westsidetrail. We all know that Atlanta traffic is nearly unavoidable. That’s why we chose to redevelop in a neighborhood that provides multiple opportunities to get where you need to go. During the worst travel times of the day, you’re still only less than 20 minutes from the best neighborhoods in Atlanta. Growing up in a commercial real estate family, I was no stranger to office buildings. Dinner table conversation often revolved around various office buildings and the plethora of challenges that comes along with them. The genesis of Ellsworth and how it became reality stems from my passion for commercial real estate and intrigue for nontraditional office space. Atlanta is a ‘tear down and rebuild’ kind of city and many of our historical structures have been leveled to make way for modern progress. I greatly admire all of Atlanta’s historical structures that have withstood the test of time to remain standing today. Chris [Dean] and I eventually began fantasizing about ways to create this product. We spent our weekends driving the market, scouting buildings which we could salvage and re-purpose as non-traditional office space. Fast forward nine long months, thirteen purchase contracts and countless work hours later… Ellsworth was born, #ellsworthATL.